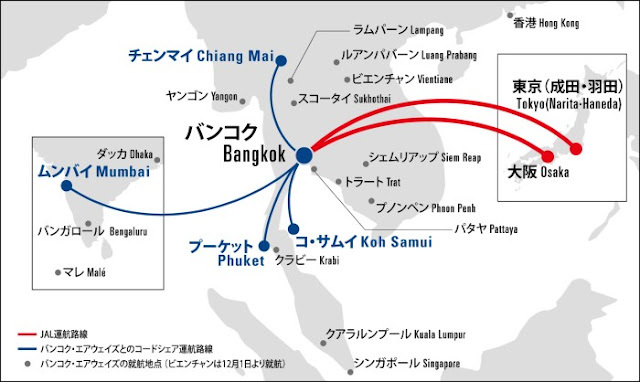 Japan Airlines (JAL) announces the new partnership with Bangkok Airways (PG). JAL Mileage Bank (JMB) members can now redeem miles on PG operated flights. But there are no words on mileage accumulation rate yet you will NOT be able to accrue mileage on PG flights. To celebrate the commemoration of the new partnership, JAL is launching a discount mileage campaign which JMB members can redeem a economy class roundtrip ticket on PG with as little as 5,000 miles! To be eligible for this campaign, you must be traveling between November 15 2012 and December 31 2013 and make your reservation no later than noon 4 days before your first departure. Application will begin on November 7 2012. Note that both of your inbound and outbound flights must be within the campaign period. If one of the legs fall outside of the period, standard rate will apply. Seems like someone release the campaign details a day early :P Today, JAL and PG have finally issued a joint press release about this new mileage program tie-up and codeshare agreement between the two airlines. The tie-up and codeshare agreement will commence on November 15 2012. While the mileage program tie-up also begins on November 15 2012, award redemption will starts on November 8 2012 for award travel on or after November 15. However, this tie-up is limited to mileage redemption. Frequent flyers from each program can redeem awards on the other airlines but mileage accumulation isn't part of the agreement. Note that PG also flies to other destinations which JAL does not codeshare at the moment. And PG will be expanding to Vientiane from December 1 2012. One of their destinations is Yangon (RGN) which recently had quite a few mistake First Class fares so some people might find it useful to transfer their SPG points to JMB and redeem an one-way ticket as their positioning flight. However, please note that only roundtrip tickets are allowed per JMB single partner award rules. And the sector miles between BKK and RGN is 372 miles so a roundtrip ticket will still below the minimum 1,000 miles and shouldn't affect the amount of miles needed.